Sales have remained solid as the year progresses, and while new orders have failed to live up to last February’s blockbuster tally they remain at a reasonable level, with launches and deliveries also stable. We know of 25 superyacht sales in February, on a par with January’s 27 and 25 in February 2014. The largest was 50m Benetti motor yacht _ Aquila _, launched in 2000, followed by 49.9m motor yacht _ My Dream_, launched by Ortona Navi in 2008. 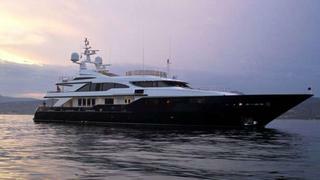 Feadship’s 2014 motor yacht launch _ Como_, at 46.2m, comes in at number three. The highest-ranking nationalities in terms of build country were Italy, the US and UK, with seven, six and six yachts respectively. According to our sources 27 superyachts came to the market in February, an increase on both 20 yachts in January 2015 and 22 in February 2014. The largest was 77.42m motor yacht Samar, launched at Devonport in 2006, followed by 62.6m motor yacht Lady Lola, launched by Oceanco in 2002 and 61.25m, 2004 Lurssen motor yacht Aurora. The highest asking price is €115,000,000 for Samar. Six new superyacht orders were reported to us in February, the same as January’s tally but significantly down on February 2014’s bumper crop of 18. The largest this February was a 50m motor yacht at Tankoa Yachts in Italy, due for delivery in 2017, followed by a 39.62m motor yacht at Hargrave in the US, also due in 2017. Three of the orders were at Italian yards but a Brazilian and a Taiwanese yacht were also among the count. We know of 12 superyacht launches that took place in February, similar to both January’s tally and that of February 2014 – 13 in both cases. The largest this February was 55m Amels motor yacht La Familia, followed by 46.4m Feadship motor yacht Kiss and 43m Christensen motor yacht Missing Link. The Netherlands and UK broke even with three each, while usual top dog Italy only had one – Taiwan also had three, the largest a 31.1m motor yacht. There were six superyacht deliveries in February, according to our sources, exactly the same as the tallies in both January 2015 and in February last year. The largest three were from Gulf Craft in the UAE – topping off with a 41.05m motor yacht. Taiwan made an appearance here again, albeit with relatively small motor yachts, a 28.04m and a 25m from Ocean Alexander and Monte Fino respectively.